The Mathematica bindings are based on the C# bindings. Since version 2.0.0 the C# bindings are CLS compliant. This allows to use them with all .NET compatible languages, such as Mathematica's .NET/Link support. It requires the .NET Framework on Windows and the Mono Framework on Linux and macOS. The installation of the Mathematica bindings is optional. You can install them as Mathematica AddOn or as Mathematica SystemFile, but you can also use them without installing them first. The section about testing an example has more details about this. You can use the Mathematica bindings without having to install them. Just give the folder that contains the Tinkerforge.dll file as parameter to the LoadNETAssembly call. The examples are set up in a ways that the LoadNETAssembly call already points correctly to the Tinkerforge.dll file if the bindings and the examples have been unpacked from the ZIP file. The section about testing an example has more details about this. To test a Mathematica example Brick Daemon and Brick Viewer have to be installed first. Brick Daemon acts as a proxy between the USB interface of the Bricks and the API bindings. Brick Viewer connects to Brick Daemon and helps to figure out basic information about the connected Bricks and Bricklets. As an example we will run the Stepper Brick configuration example. To do this open the ExampleConfiguration.nb Notebook from the examples/Brick/Stepper/ folder in Mathematica. Depending on if and how you installed the Mathematica bindings you have to adapt the LoadNETAssembly call accordingly to make Mathematica find the Tinkerforge.dll file. Further details about handling .NET libraries in Mathematica documentation. If you did not install the bindings then the LoadNETAssembly call can stay as it is, if you run the examples from the unpacked ZIP file for the bindings. The examples are set up in a ways that the LoadNETAssembly call already points correctly to the Tinkerforge.dll file if the bindings and the examples have been unpacked from the ZIP file. Now you're ready to test this example. Evaluate all cells in top-down order to do this. 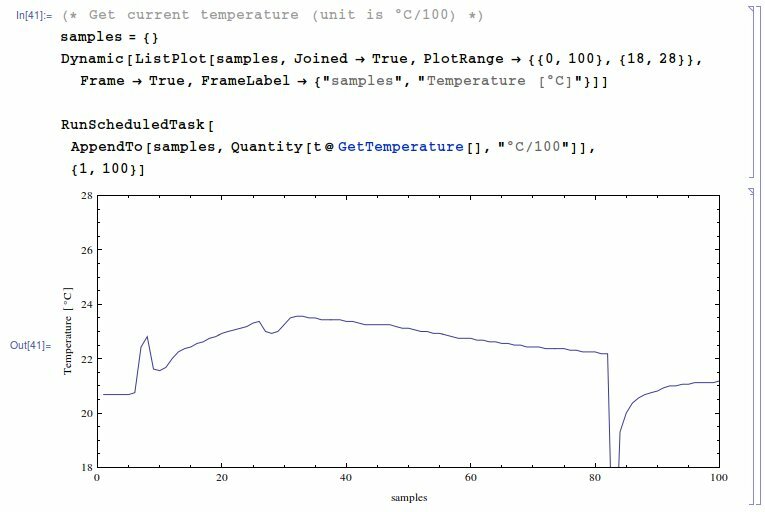 Here's an another example showing a dynamic plot of Temperature Bricklet measurements. The drop at sample 82 was created using a freezer spray.